I want control of my BI NOW! Have you ever needed a business insight right away, but couldn’t get it? If yes then you have an age old problem: No instant access to data in a cumbersome IT controlled environment worsened by a steep learning curve to actually use an enterprise BI tool. The answer is not rocket science, its simply Self-Service BI. That means freedom to access data at will along with simple and easy to use BI tool to crank out actionable business insights! How can we make this happen? 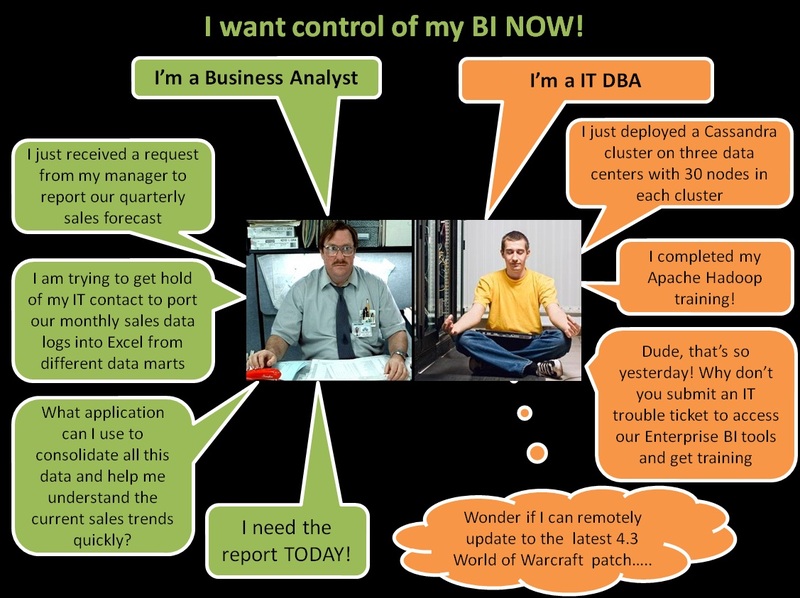 How to get IT to embrace Self-Service BI? What are some of the disruptions beyond Self-Service BI? Stay tuned for a deeper dive into these questions! Adoption of social analytics beyond the obvious – Are we there yet? No!